There are situations that you have to make your decision for your sake and others. This decision might involve you directly or indirectly. In every difficult situation most commonly not only your thoughts influence your decision but also your emotion. 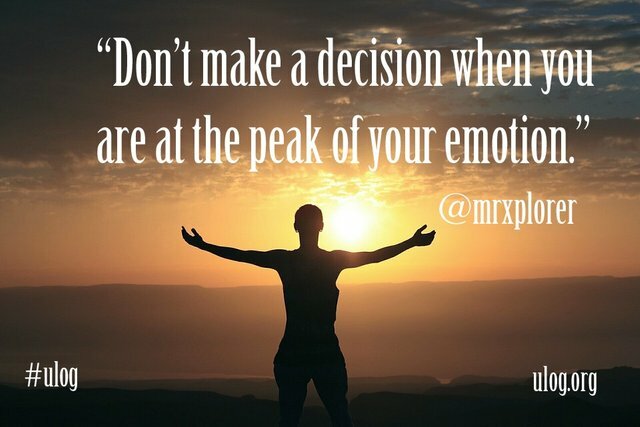 Most common mistakes of people in making a decision is to make it when their emotions are at high or low. Don’t make a decision when your are angry or disappointed on someone or something. It may be your job or your boss. May it be your unfinished tasks or your co-employee, making decision when your at peak of a certain emotion might lead you to bad decision that you might regret later. Let your emotion subside, let the pain, fear, anger, disappointment and depression subside before you make any of a crucial desicion. Think hundred times before making any move. Be sure to what you are planning to do. When you make a final decision, you need to make sure you will not regret it later and you’ll have to stand by that decision. Study showed that these people who made a bad decision because they involved their emotion were low in emotional quotient. They can’t control their emotions and getting to the point that it hurts other or disrupt others. Most commonly, people with high emotional quotient are successful people in their chosen field. I hope you learn from this #ulog-quotes.